Chilean Senator Andres Allamand announced Tuesday he will introduce a bill that recognizes gay couples with civil unions. The Latin American website InfoSurHoy.com is reporting that the bill would give both gay and straight couples all the rights and obligations of marriage. 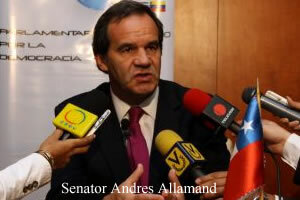 Allamand's party, Renovacion National (RN), has already endorsed the package of laws called Acuerdo de Vida en Comun (AVC). Under the proposal, marriage would remain a heterosexual union. Members of Chile's largest political party in the Senate, Union Democrata Independiente (UDI), however, are divided over the legislation. Several are not interested in voting on the controversial measure so close to elections in August. But recently elected Chilean President Sebastian Pinera has backed the measure. Pinera campaigned for the nation's top job as an independent but leads the Coalition for Change political block, which includes both the UDI and RN parties. Pinera is considered a right-wing politician, but he has embraced gay rights. A Pinera campaign advertisement included two gay men. Argentina's Senate is expected to vote on a gay marriage bill in July.